Just in time for a new year, it occurs to me that I mastered some excellent habits in 2013. As this achievement - making resolutions and actually accomplishing them - is heretofore unprecedented in my 38 years of life, I thought I would share the habits that I have learned this year before you make a final decision about your resolutions for next year. I started carrying my planner everywhere. I bought bags and purses that fit my planner and made almost no exceptions about carrying the planner. If I left the house, the planner left with me. I wrote everything down. Everything. If it needed doing/going/thinking about, and I didn't do/go/think immediately, I made a note of it somewhere in my planner. I erased the evidence of whatever I did. Took a shower? I wiped down the walls, refilled the empty soap container, and hung up the towels to dry. Cooked supper? I put away the leftovers, wiped off the stove top, and threw the dishes in the dishwasher. If I was moving from room to room, I grabbed one thing when I left the room and brought it into the next room to put away. I found, bought, or created homes for the items in my house. I developed a repertoire of yummy, healthy recipes to cook and freeze for my family. I decluttered and donated lots of stuff that we never use. I blogged or drafted my novels almost every day this year. Here's the thing about these resolutions that I made, kept, and have turned into positive habits - they were NOT made on January 1st. No, my first day of last year, I planned to lose weight, exercise, and get a full time job. I did lose weight, but not until I finally took care of a medical condition that haunted me all year. I did not exercise. And I still don't work full time. My successful resolutions, instead of being made on January 1st, were made with you, my Loyal Readers, watching and supporting me. 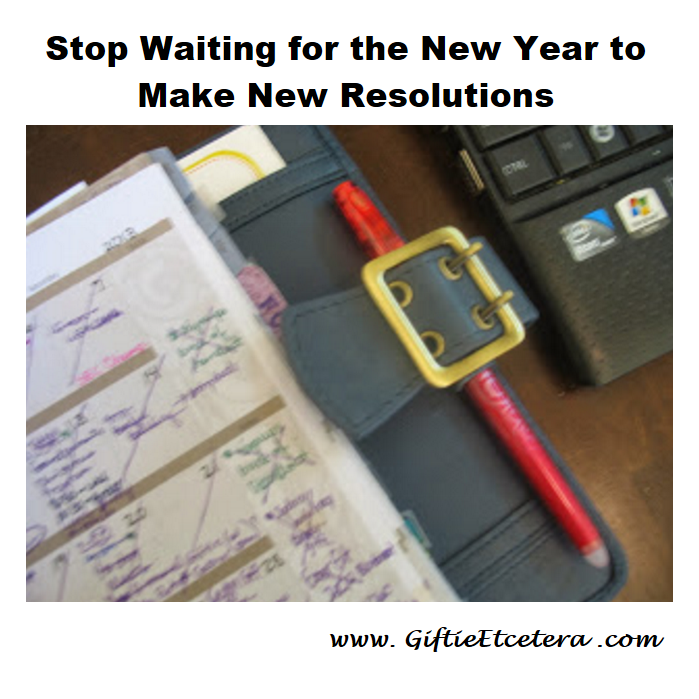 My resolutions evolved naturally, solving problems that existed in my life and my home. Let me encourage you to make your own resolutions the same organic way. Think about your problems. It's not about improving you. It's about improving the things around you to make life better and easier for you and those that you love. Don't resolve to lose weight. Resolve to eat healthy fruits and vegetables everyday. Don't resolve to get organized. Resolve to create a meal plan, write things down, or use a planner. Don't resolve to be perfect. Resolve to be imperfect and to be okay with that, all the days of your life. Thank you for sharing your year with us. I look forward to reading your blog every day. So totally in agreement. I've gotten SO much better this year at many small things; and most of my goals and resolutions for the coming year are basically small things I can do consistently to help myself and/or my household feel better. I thought you should know though that the search bar on your blog doesn't seem to work. I have tried searching for things several times and it just returns me to the same page I was on. Great point about your successful resolutions not being made on 1/1. Great post. And those are the kinds of habits that stick! Oh, I love this. This makes me believe that as long as we make a conscious effort, we will be okay.